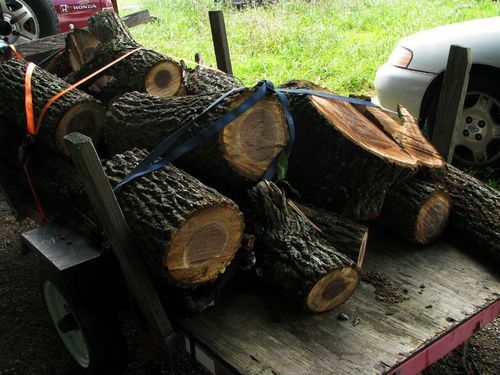 This weekend, I spent my time bringing home some walnut and maple logs. The limbs don’t make good lumber, even if they are big enough to make a saw log. Limbs are reaction wood and when you remove the weight from them they move, sometimes a lot! Saw a horizontal limb into lumber and you can make some nice pretzels and you won’t have to do anything… Just saw ‘em and watch ‘em curl. Same deal with leaner logs. I use some of the limbs to make bowls, rolling pins and other items for fun, but I can’t come close to using all the limbs and I hate to burn them. 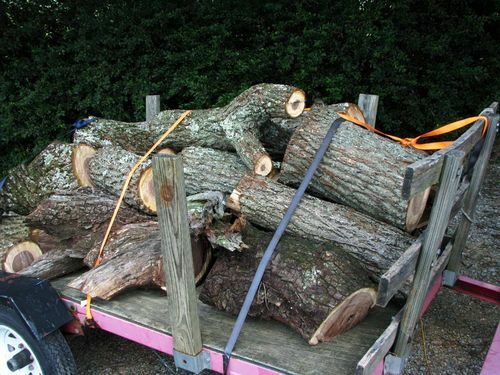 Here’s the load I took to the woodworking shop at the Senior Citizens Center. This chunk of walnut is going to make a couple of nice bowls. When I have a stressful day, I take a chunk of green wood and it’s restful and relaxing to watch the ribbons of green wood shoot off the wood. I made sure to get a good selection of crotches and limb sections that should have some interesting grain patterns when they are turned. I’ve still got a lot of chunks of walnut if anyone close to East Tennessee wants some. It’s great that you are taking some to the Senior Citizens center. Got photos of your work? I saved some of the chunks to turn a bowl or two as I get some extra time. I’ll be sawing the walnut logs into 2 1/2” thick slabs next week and I’ll put up some pictures of the lumber. I knew wood moved but, as a new woodworker, I am still learning the ins and outs of it. Your explanation of limb wood explains why the holly wood that I cut up for “box” wood has slowly turned into pretzels! LOL Thanks and if I was still livin’ down near Athens, I would take you up on the free wood offer. Hal, that will keep them busy for a year!! Do they have lathes at the senior center too? Nice work, and this is one time I wished I lived closed to east Tennessee. They have at least one lathe and some of the members there have them at home. The bandsaw they have doesn’t have a bandsaw riser kit, so 6” is all they can resaw at the woodworking shop. I am going to take them a bandsaw sled that I no longer need, but they won’t be able to get the most out of it without a riser kit. Some of the projects they make there are beautiful. On gentleman specializes in dulcimers and some of them make very fancy boxes. They also have classes on how to use the equipment safely and classes on specific types of woodworking. Every time I switch from one size to another as I’m sawing lumber, I end up with a thin board. They can be from 1/8” to 1/2” and I’ve been saving them. I also saw some walnut, maple & cherry in 1/2 & 1/4” thickness for gunstocks. Last week I had a bunch of thin wide oak boards that were dry and ready to use. I took them just as a couple of box makers were running out of wood. When they run out of this batch, I’ve got some small Bartlett pear logs that make great turning blanks. I’ve also got a dogwood log that I’ve been making some tool handles out of. I noticed on your profile that you’re from Springfield, MO. I live near Neosho—we’re practically neighbors! If you need some wood sliced up or want to pick through my pile for turning blanks, come on over. I’ve got a Norwood portable sawmill & lots of wood. Want me to pack it with me when I come visit the Maloof home? I think I can get it in my carry on bag. 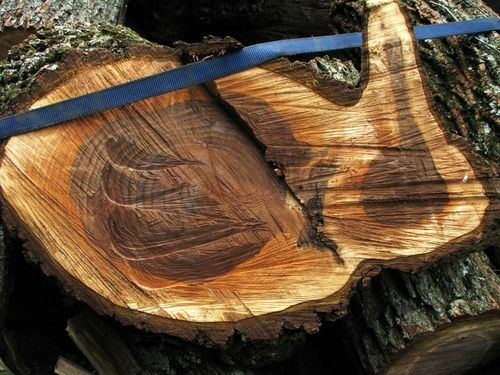 You really have good wood that will last you for years (it would last me a lifetime!). I have to start my Maloof Low-Back dining chairs… almost started the other day… then, it so darn HOT! !